Gurudeva Bhavan Guesthouse is located in the heart of Krishna Valley, just 70 m from the temple of Sri Sri Radha Syamasundara. Staying at this guesthouse allows you to experience simple life in harmony with nature. In order to maintain the clean and violence-free atmosphere of the village, smoking, alcohol, drugs, eating meat, fish and eggs are strictly forbidden in the accommodation and on the whole territory of Krishna Valley. Elefant Guesthouse is situated on the farm, at the entrance to the property. This accommodation is provided for visiting devotees and spiritual seekers. There are 3 double rooms, one single room and a family room where four can rest. All rooms are en-suite. Elefant Guesthouse has got electricity and so there is lighting and power sockets available. This property also has got 24 hour hot running water and free WIFI. Delicious Ayurvedic vegan breakfast, lunch and dinner are cooked upon request. Laundry services available. Kamala Guesthouse is situated in Somogyvamos village, close to the entrance of the farm. It welcomes spiritual seekers, farm volunteers and anyone interested in the philosophy and practice of simple living. All rooms are dormitory type, male and female guests stay separately. There are four rooms with 3 dorm beds each. All rooms share separate male and female bathrooms. Kamala Guesthouse has electricity and so there is lighting and power sockets available. This property also has got 24 hour hot running water and free Wi-fi. Delicious Ayurvedic vegan breakfast, lunch and dinner are cooked upon request. Laundry services available. You can walk to the temple through a scenic road in about 20-25 minutes or drive just in a few minutes. Paid parking (500 HUF per day for a motorcycle, 600 HUF – for a car) is available in the garden. Guest can also park for free at the dedicated parking lot, next to the Krishna valley’s reception. Large garden of the Kamala Guesthouse welcomes guests who prefer freedom and flexibility. You can park your caravan, pitch your own tent or rent a tent from the guesthouse. Bathrooms and toilets as well as electric plugs and free Wi-fi are available in the Kamala Guesthouse. Laundry services available. Paid parking (500 HUF per day for a motorcycle, 600 HUF – for a car) is available in the garden. Guest can also park for free at the dedicated parking lot, next to the Krishna valley’s reception. 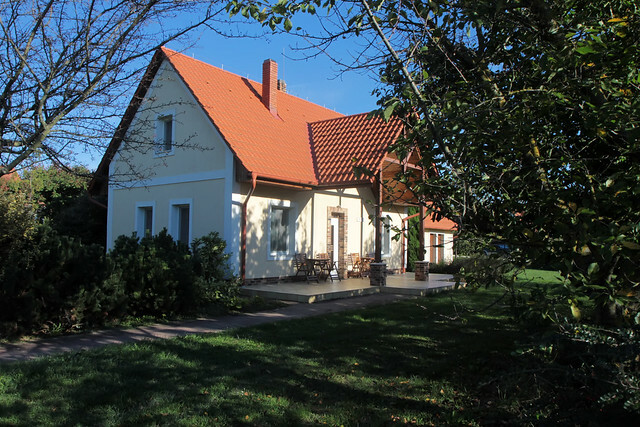 A 10 min drive away from the temple, this traditional house is located in the village of Somogyvámos. It is renovated and equipped with everything that is needed for even a longer stay. Two bedrooms, living room with an open kitchen area provide enough space for up to 6 adults. Private garden with fruit trees is perfect for family gatherings in the warm time of the year.